We’ve been going through a lot of greens lately – for smoothies, juices, sautees, etc. So, when Jen from BAM Communications mentioned organicgirl salad products, I was intrigued. A little while later, a box arrived on our porch with romaine hearts, baby spring mix, and supergreens. Each container has a plastic hard cover, but it’s also sealed with plastic on top. Until you unseal it, the greens stay fresh (and pre-washed!) for quite a while, but the plastic top means that if you don’t use it all, you can easily keep it stored in the fridge. All this convenience and ease really came in handy one night when it became dinner time and we were starving after work. A few days earlier, I had brought home pre-sliced ribeye from Zion Market and some bulgogi marinade. Along with a pot of rice and some lettuce, a plan for dinner was born. The meat went in for a quick marinade, courtesy of my new vacuum marinator container. As the pot of rice started going, I cooked up the meat in a wok, letting the marinade reduce a little and the edges of the meat crisp up. A dish of sesame oil and salt for dipping, and dinner was ready. In and out in less than 30 minutes. 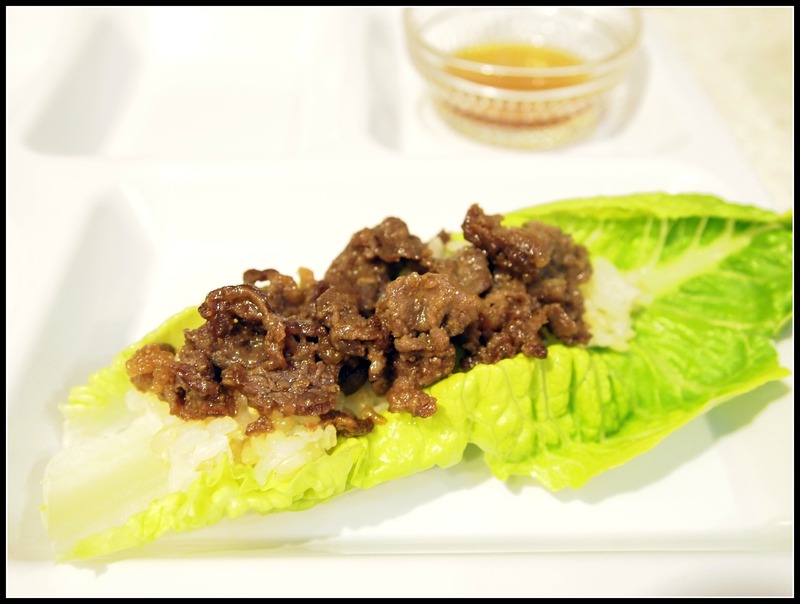 We sat down with plates of rice and meat, grabbing a romaine leaf out of its container and filling it with tasty goodness. The romaine was crisp and tender and the perfect vessel for a meaty bite. It was incredibly easy to pluck a piece out, especially knowing I hadn’t had to separate the leaves, wash, and then dry them. I am slightly conflicted between convenience and excess packaging, but I’m slightly less guilt-ridden knowing the greens containers are made of recycled material and are recyclable. You can find organicgirl greens at Ralphs, Jimbo’s, and Vons. Now… how best to enjoy the salad greens without feeling like I’m eating a salad? Perhaps something like this? 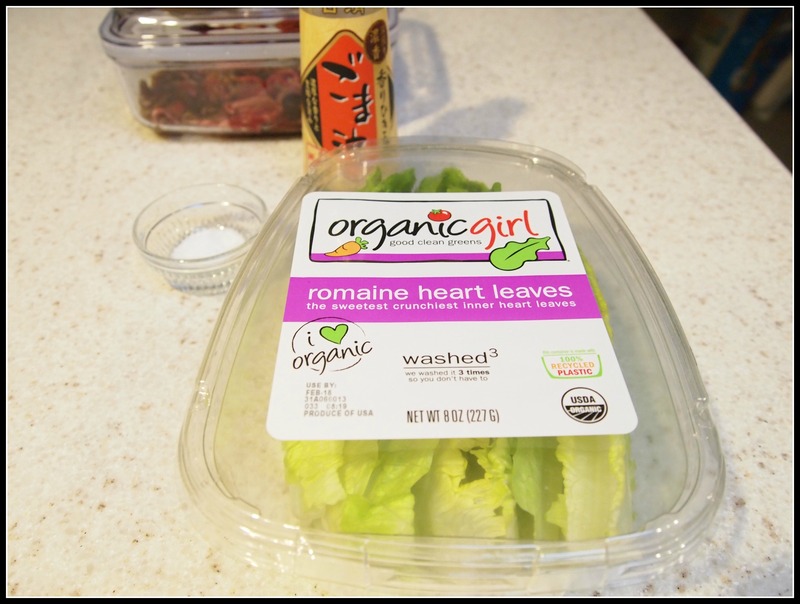 This entry was posted in food, product review and tagged organicgirl, product review, romaine hearts, washed greens. Bookmark the permalink. Oo, you went for the non-salady point of view! Nice! We still have some left, I’m kind of excited at how long they last in their shell. Ha! I am not a salad fan (although, I had a nice beet salad from Trader Joe’s the other day), so if I had done a salad review it would have been more “Fresh, washed greens were as good as salad greens get. With dressing.” I still have the spring mix unopened and it’s doing really well in its container. I think that’s pretty awesome. I LOVE organicgirl salad greens. It’s all I’ve bought since I first spotted them weeks ago. I think the super greens are my fave. I have purchased greens in plastic containers for quite a while and this brand is excellent.